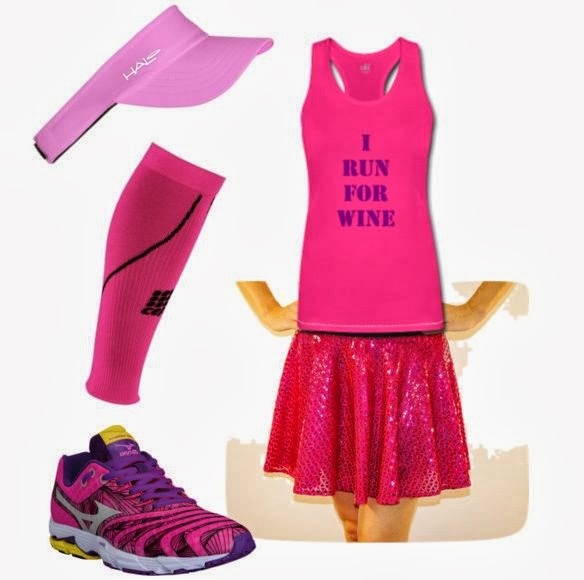 Aside from training, the thing I am most concerned about for an upcoming race is my outfit. I blame this entirely on runDisney, where I ran my first race and everyone was dressed up as various Disney Characters. I presently own multiple sparkle skirts and coordinating CEP sleeves. My best friend and I are running the Women's Running St. Pete Half Marathon on November 24th. When Keri signed up for this event, we instantly started discussing what we were going to wear. One thing was certain - we would be decked out in our favorite color, pink. I even joked we could dress up as Flamingos.....well, we are pretty much going to look the part. Above is my tentative outfit. A Pink Sparkle Skirt matched with a Pink I Run For Wine shirt (with Purple Glitter writing to match my shoes! ), CEP Women's Compression Sleeve , a Pink Halo Visor, and Mizuno Wave Sayonara . I know this is a bright outfit, but we agreed to go all out in the color pink for this fantastic event celebrating women runners everywhere. There is still time to sign up for the half marathon or 5K. 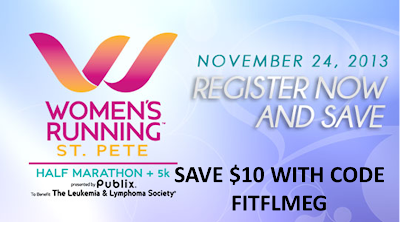 You can also save $10 off the Womens Running St Pete Half Marathon with discount code FITFLMEG! If there are spots remaining, prices will increase on November 18th - the last day to use my code will be November 17th.